The flight from Boston to Chicago isn’t the most scenic, but if you’re lucky enough to snag a window seat—no mean feat these days—study the patchwork landscape with a discerning eye about 40 minutes into the flight. You’ll notice something a bit peculiar, at least for North America. 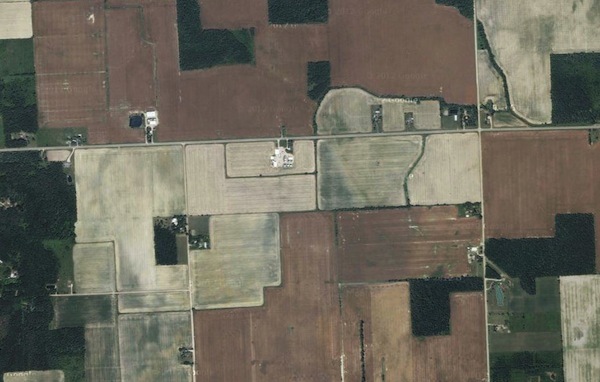 Instead of the usual tableau of square or rectangular farmsteads, you’ll see ribbons of agronomy. They’re a Canadian ghost of geography, a relic from when the region was known as Nouvelle-France. Back in the early 17th century, France was trying to stabilize its colonial foothold in the New World. Cardinal Richelieu, an advisor to the king and powerhouse in French politics, hatched a plan to encourage more intensive settlement. 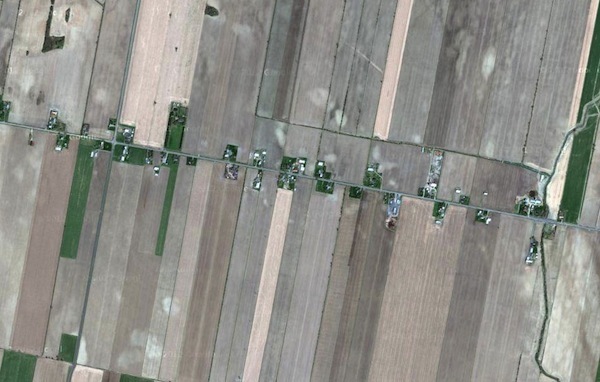 As a part of that, he parceled the land similarly to the way it was divided in France—long, thin strips oriented perpendicular to a transportation route, which in New France was primarily the St. Lawrence River. The layout traces its roots back to medieval times, but what’s more intriguing, at least to me, is how ribbon farms—or rather the lack thereof in the much of North America—shaped attitudes toward transportation. Much of arable North America, though, was not allocated in ribbon farms. The Public Land Survey System carved up large portions of the United States into one square mile sections, each of which were subdivided to create farms and aggregated to form townships. Canada adopted a similar system for its prairie provinces, called the Dominion Land Survey. Under such schemes, farms are more square than linear, a quirk of geography that I believe influenced the development of the entire nation. Here’s how: Roads snaked out to farms where they were needed, which is to say nearly everywhere. Farmsteads, and later suburban houses, were more or less evenly distributed across the landscape rather than concentrated next to existing roadsides. The fact that the farm, not the transportation, came first is important. In New France, transportation was clearly the foundation. But in much of the rest of North America, parcels were delineated first. Transportation routes followed, a geographic case of the tail wagging the dog. Here’s why that matters: With ribbon farms, the expectation is that transportation is king. Living under such a plan, I imagine networks have a certain planning primacy which dictate certain characteristics of the parcel. But when the U.S. started with square farms, the process and the results were the exact opposite. We plotted the farms and then pondered the logistics. In that context, it’s no surprise that we feel transportation should come to us instead of the other way around. As Americans, we pick a place to live and then figure out how to get where we need to go. If no way exists, we build it. Roads, arterials, highways, Interstates, and so on. Flexible and distributed transportation networks are really the only solution compatible with that way of thinking. Trains, which rely on a strong central network, never had a chance. We were destined for the automobile all the way back in 1787, when we first decided to carve up the countryside into tidy squares. Town, section, range. Pick your plot, worry about the details later. It’s the American way, and it’s driven the psychology of an entire nation. Satellite images courtesy Google Maps.